Ko Tao is one of many beautiful islands in Thailand – and it’s a diver’s paradise. In fact, this is what this island is most popular for – for it’s diving. There are so many diving schools on this island, and so many places to explore, it’s known all over the world among divers. 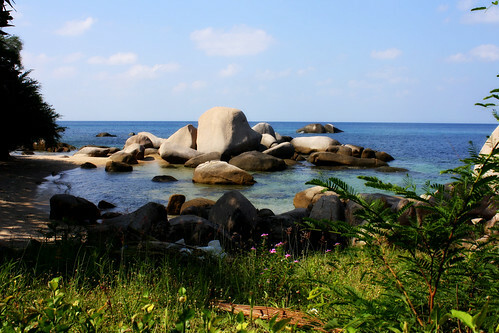 Ko Tao means “turtle island”, mainly because some parts of the island look like turtle. Nowadays, the island is filled with people from all over the world, and there’s a reason for that: the nature here is just beautiful. Along the west coast you find lots of white sandy beaches, and it comes as no surprise that it’s also the most popular place for tourists to stay. Lots of guest houses, bungalows and hotels can be found here in different kinds of price ranges. With a bit of luck, you might even spot whale sharks while scuba diving around Ko Tao – if you’ve never had an encounter with these giants of the ocean, it will be unforgettable. If you want to see whale sharks, the best time to visit the island is between March and May, and then again around September/October. In recent years, touristic infrastructure has sprouted rapidly. Nowadays, it’s not just beach bungalows and diving anymore – you find luxury resorts, cinemas, bowling vicinities, you can go paintball shooting, hiking, trekking and so on. And of course – lots of great seafood to enjoy here. There are still areas of the island that are more quiet, and if you prefer a secluded little island paradise feeling, you can find that here too. Especially during high season you should book your accomodation before you arrive on the island – otherwise, you might end up paying inflated prices, and lots of nice accomodation will already be booked. Ko Tao is a beautiful little island for those who want to have an active island vacation and meet other nice people.